Okay I do realize that recreating Steaua Bucuresti Champions League success of 1986 might be a semi-delusional long shot from reality, especially going into my 3rd season with Dynamo Kyiv. One could still dream. For now I can try to institute a system that in the long-term could make such a dream real, or at least make Dynamo Kyiv into a continental force to be feared even by the likes of Barcelona (remember 1998 anyone?). Although Dynamo is a big dog in Ukraine’s backyard, it is only a small fish in the bigger European pond. Somewhat counter-intuitively, I need to start thinking more as an underdog in order to start winning more consistently against stronger opposition. 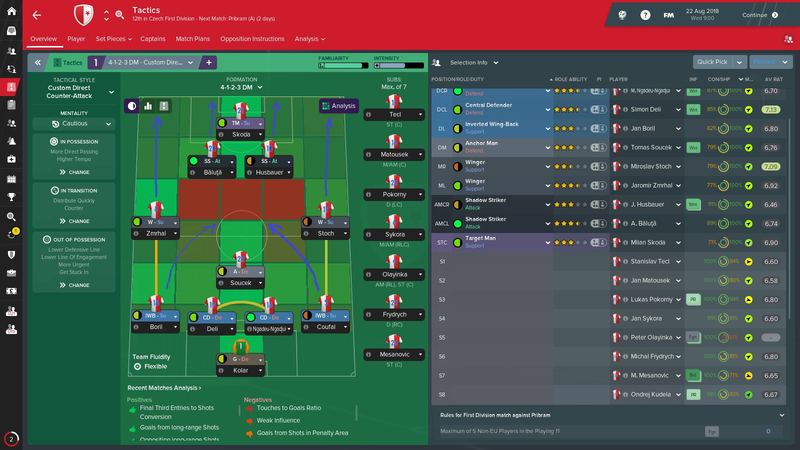 I intend this to be a general guide for anyone managing a small side in the Champions or Europa League, even though the tactic was made with Dynamo Kyiv (and Slavia Prague as a specific example) in mind. I will show that the concepts discussed can be applied to any club that is considered an “underdog” in domestically or in continental competition. Over the years playing football manager and managing a variety of teams, I started to see some patterns emerging. In general strong, world-class teams such as Real Madrid, Liverpool or Bayern Munich tend to be successful in Champions League largely because they have better players than their competition. Tactics play a role of course but in general better talent (and higher salaries) win most of the time. This is the stark, sometimes unfair, reality one must face when competing internationally. World-class strikers and defenders with far superior technical and physical traits. Very technical midfield players, who thanks to their supreme passing and mental attributes, at times appear to able to thread a pass through the eye of the needle. Usually their wingers are not the old-fashioned type who always selfishly cross to the striker upfront. They act as another threat on the sides, basically a flank striker. These technical and highly offensive inside forwards will cut in and attempt to shoot even though crossing might have been the better option (as an example just watch Neymar play for PSG on any given night). This list might seem a bit depressing at first glance, but it also offers hope because with all of these strengths come matching weaknesses which we should be able to exploit. So how can one match or even outplay the big clubs in all the area listed above? Firstly, to counter their striking force, we will never be able to field a world-class defenders of similar caliber. Yet often quantity will win over quality. One thing I learned from AI managers in this year’s version of football manager, is that even the top sides can have a lot of difficulty overcoming a good parked bus. While playing as Chelsea, Man City and Roma, I had many games where the underdog parked the bus fiercely, placing five defenders, and sometimes two or three defensive midfielders, between us and the goal. The propensity towards having very talented attacking midfielders can sometimes play against the top clubs, because they will rarely have the luxury of playing with two strikers. In addition, many of these clubs possess elite inside forwards who will also demand to be played. So the two most common two striker formations, the 4-4-2 and its narrow diamond variation, are often not an option for clubs such as Man City or Barcelona. Instead, we often see the numerous variations of 4-2-3-1 and 4-3-3. One weakness of such formations is how often the attack can be stifled by a combination of 3 deeply-set central defenders with either defensive fullbacks or defensive midfielders supporting them. When you have five players dropping deep in front of your keeper, it leaves little space for the opponent to create dangerous chances in the penalty area. So while the main idea behind all parked bus tactics, preventing your opponent from scoring, could be rather simple to achieve, we still need to score goals in order to win. This can also be achieved by playing to our strengths. 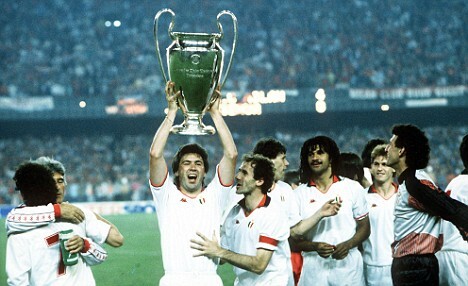 So what, you may ask, do the underdogs possess that the football giants, such as Barcelona do not? To answer the question above – classic wingers (you know the ones that will hug the line, dribble and cross all day long and will do little else) and the big strong Target Man. They all have one thing in common, in today’s footballing world, both of these player archetypes have gone the way of the good old English 4-4-2. While they are still being used by some teams in the top 5 leagues, the managers employing such tactics often face the ridicule of being labeled as tactical dinosaurs and worse. So I am not suggesting that we go back to using 4-4-2. It had its glory days and truthfully football probably did move on as teams became too familiar with this formation and developed better ways to counter it, whether through gegenpressing or possession-heavy systems. But some concepts that the 4-4-2 used can still be successfully applied to modern tactics. Concepts such as the idea of having a pure winger supplying the tall and strong striker upfront. It is much easier to skip over the opponent’s midfield with a long cross to the central striker who is already in a dangerous position rather than having the inside forwards bring the ball in from the flanks and dribble or pass through the congested midfield. Not to say that this will not work for the world-class clubs, which already have many options in the inside forward position and often are able to compete easily in the midfield possession battle due to their superiority of players. So clearly, we have no chance using their own tactics against them, since they are already too good there. Even the best inside forward at a club like Dynamo Kyiv might only be seen as an average level player at Real Madrid. To give an example, look at the case of Yarmolenko at West Ham. Many players in top leagues are able to cut inside from the wing, dribble, pass and shoot on goal. Yarmolenko does this with a lot skill and was one of the best in Ukrainian League. Having moved to Dortmund and then West Ham, he has increasingly become a fringe rotation player simply due to the fact that clubs in top European leagues tend to possess a lot of skilled inside forwards already. Very few, besides Messi, Hazard or Neymar, can trully distinguish themselves playing in this role. As result, it is nearly impossible to find worldclass inside forwards at a smaller club. Often when such a player emerges, they are quickly bought by a much richer club. On the other hand, pure crossing wingers can often thrive at a tiny club because they can specialize at what they do best without really attracting much notice from the giants. In the game, to be a truly great crosser, much fewer attributes are needed. High attributes in crossing, passing, technique, vision and pace are much more common in players from smaller clubs. Taking the example of Sykora from Czech Slavia Prague, look at the comparison of key attribute distribution for a winger versus inside forward. Not only does an inside forward need more attributes to perform his job but he also needs to have better technical and mental attributes, which is usually very rare to find in players from outside the top clubs. Now speaking of the player who is usually the target of all those crosses from the wingers: the good old Target Man. This is my ideal Target Man from Slavia Prague; its current club icon, Milan Skoda. Like the Czech car that is his namesake, he is extremely sturdy, reliable, resilient and uncompromising in his relentless drive to help his team to a goal in any way possible. There is no room for unnecessary gimmicks or tricky showmanship. You are not driving an Alfa Romeo or Mercedes here. This is a Target Man. Ball meets immovable object. I believe that top clubs have forgotten the power that such a player can bring to the team. Some still employ players in the similar mold, the all-time great strikers such as Lewandowski, Cavani and Kane who all possess worldclass talent and are very rounded in their abilities. But unfortunately they do not have the pure physical strength, jumping reach, or the selfish team mentality of a true Target Man. There is still the odd one here and there such as Roma’s Dzeko or Chelsea’s Giroud, but in many cases they are rare breed who have been pushed to the periphery of the team or are playing in a system that is not really designed to get the best out of their unique skill set. For a Target Man to truly shine, the system has to be designed with him as the central outlet but not the ultimate source of goals. He is the ultimate middleman, that key catalyst in the tactic. When provided with adequate supply from the wings, midfield and even defence, such central striker has to be able to control the ball while under extreme pressure from opponent’s defenders and defensive midfielders. This is where his great strength, balance, jumping reach and constant teamwork show in aiding him in exerting control. He must be able to quickly pass the ball to the shadow strikers. These could either be advanced midfielders or onrushing central midfielders. The closer they are already to the Target Man when he receives the cross the better the chance of him knocking it down or passing it successfully to them. As a result they must be among the most mobile and agile of players on your team. Surprise factor is often the way to win even against the greatest opposition. It worked for Sun Tzu, and should work in football. As an underdog, you do not have the luxury to field world-class finishers upfront. Instead you must beat your opponent with an unexpected weapon from a new area. A veritable kick in the gonads in a tactical sense. Image above: Dennis Bergkamp, the self-proclaimed “shadow striker”, was well-known for his knack for doing the unexpected from his deeplying attacking position. Hence the idea behind the shadow striker. It is a role that operates in the hole between the number 9 and the center midfielders, basically like a very withdrawn striker that attempts to get second balls by moving into space or arriving late in the area. It is not a role that demands much creativity from the player, but lots of positional intelligence, off the ball movement, and honed instinct for scoring. Basically what any typical striker should have. Take an average striker, put him in the advanced midfield position and you have yourself an excellent shadow striker. As an added bonus he should be a longshot specialist. By taking a striker who might be considered only a backup option for a big club you might transform him into a deadly threat when operating from a new space. In other positions, one could also use average players in surprising ways. Such as by putting a midfield playmaker or gritty ball-winner on the flank as a wingback. From there he can be instructed to cut into the midfield and try to shield the defence and drag the opponent fullbacks with him. With his background as a midfielder he will operate in an area where he can truly help out the team with his tackling and passing. He will also potentially drag the opponent’s fullbacks into midfield with him who might not be comfortable playing in that area. As a result freeing up more space for your wingers to achieve 1v1s and cross more successfully to the striker. I found that in the current Match Engine, crossing can be difficult with the fullbacks often blocking the majority of your crosses, even from wordlclass wingers. But the success of cross increases immediately once you add inverted wingbacks into the formula. No, I did not mean the most famous musical team of jesters in the world. Instead, when creating a tactic, I always try to keep this motto in the back of my mind: Keep It Simple Stupid! Try to find a way to emphasize all the strength of your team while minimizing its weaknesses and do not needlessly over-complicate it. So lets apply all the points discussed above in a tactic that you can use for any underdog club in any league. In the image, blue arrows represent the expected directions of movement. You can see how the defensive core of the CBs and Anchorman guards the back and wingbacks move in to help. This creates adequate coverage for the four “runners” to advance. I changed the role of the LM to defensive winger as I found it lends more stability to the formation with the RM allowed to be more adventurous. Using the example of a Champions League lightweight Slavia Prague, to take advantage of its strengths would mean creating a tactic with at least 5 players in the back which should provide us with good defensive stability. From such solid defensive base we should also be able to take advantage of Slavia’s strength in traditional wingers who with their excellent pace and crossing will lead our counterattacks. Also having two inverted wingbacks that tuck into the midfield, will prove invaluable as their movement will make it easier for wingers to find 1v1s. The more 1v1s the wingers can achieve on the flanks the more chances they will have to cross to the striker with less interference from opposing fullbacks (hopefully those will be busy tracking our inverted wingbacks). Finally, scoring will be come from the powerful central striker who upon receiving the cross from one of the wingers will hold up the ball for the two shadow strikers moving into channels around him. The shadow strikers are where you need to put your deadliest finishers and longshot experts. Such players will also come in handy during set pieces. Set pieces should never be ignored by underdog clubs as they will be a valuable source of goals in big games against dominant sides. Speaking of dominant sides, this is what Slavia’s European record looks like so far. While Slavia barely scraped through those two aggregate wins and the football on display was far from beautiful, we nevertheless won. Advancing to the Champions League’s Group Stage is no small feat and especially being able to do so against two sides that are far richer and more talented than us. I’m excited to see what future victories can be achieved with this tactic for Slavia, Dynamo Kyiv and perhaps other underdogs. Even though the tactic is build with the strength of those teams in mind, the general concepts should still apply to any club, provided it possess the right players. Above all, do not be afraid to experiment to bring out the strengths of your own squad in unexpected ways.